Q: What temperature should my freezer be? Your freezer should be set at 0 F (minus 18 C) or lower to preserve food for extended periods. Freezing keeps food safe by slowing the growth of microorganisms that cause both food spoilage and foodborne illness. Q: What can I freeze? You can freeze almost any food. Some exceptions are eggs in their shells or food in cans. However, once canned food is out of the can, you may freeze it. Q: Is it safe to freeze meat or poultry directly in its supermarket wrapping? Yes, freezing meat or poultry directly in its supermarket wrap is safe but only if you will use the food within a month. For longer storage, overwrap the package using airtight heavy-duty foil, plastic wrap or freezer paper, or place the package inside a plastic freezer bag. Use airtight freezer containers to repackage family packs into smaller amounts. Q: How should I freeze food? To promote faster freezing, freeze food in shallow containers. Slow freezing creates large, disruptive ice crystals. Ideally, food about 2 inches thick should freeze completely in about two hours. If your home freezer has a “quick-freeze” shelf, use it. Do not stack packages to be frozen. Instead, spread them out in one layer on various shelves, stacking them only after they are frozen solid. Q: What is freezer burn? Freezer burn is the drying out, or dehydration, of frozen food. It appears as grayish-brown leathery spots and is caused by air reaching the surface of the food. Although it is not a safety issue, it affects the quality of the food. Cut freezer-burned portions away either before or after cooking the food. Heavily freezer-burned foods may have to be discarded for quality reasons. Q: What are the safest ways to thaw frozen foods? You can thaw food in the refrigerator, in cold water or in a microwave oven. Small amounts, such as a pound of ground beef, may defrost overnight; most foods require a day or two. 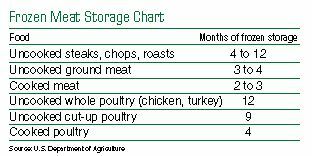 For large items such as a turkey or whole chicken, allow at least 24 hours of thawing at refrigerator temperature for every 4 to 5 pounds. When thawing food in the microwave, plan to cook it immediately after thawing because some areas of the food may become warm or begin to cook during microwaving. For faster thawing, place food in a leak-proof plastic bag and immerse it in cold water. Check the water frequently to be sure it stays cold. Change the water every 30 minutes. After thawing, cook immediately. Do not thaw foods in the sink or on the counter. These methods can leave your foods unsafe to eat. Q: Does the color of frozen food change after thawing? Yes, color changes can occur in frozen foods. The bright red color of meat as purchased can turn brownish because of a lack of oxygen, freezer burn (drying out) or abnormally long storage. Be sure to properly package foods to retain the quality. Q: Once meat is thawed, is it safe to refreeze without cooking? Yes, you can refreeze meat that has been thawed in the refrigerator, although the meat may lose some quality due to the moisture lost through defrosting. Q: Can I cook frozen foods without thawing? Meat or poultry can be cooked from the frozen state. However, allow about one and a half times the usual cooking time. Q: How long can I keep foods in my freezer? Food stored constantly at 0 F (minus 18 C) will be safe but the quality suffers with lengthy freezer storage. Write the date you placed the food in the freezer on the package and arrange your freezer so you will use the “oldest” packages first.